The end of September marks the half-way point on the road to compete at the FLYRA Middle School Cross Country State Championship on a real cross country course at Holloway Park in Lakeland. September saw middle school runners from all parts of the state running impressive times over different courses. Unlike high school runners, the middle school athletes compete on courses of varying nominal length: 3000m, 2 miles/3200m and 2.1 miles (limited to Miami-Dade County). This report discusses the top female and male middle school performers statewide at the three listed race lengths. The focus of this report are the middle school runners competing at the MS level and not running regularly on a high school team. Many of these runners will be among the leaders in the high school ranks in coming years.The names discussed here will be among the favorites to medal at the FLYRA MS State Championship Meet on November 1. Gianna Milan (pictured above), an 8th grader at University School, has the top 3000m cross country time so far this season at 11:24. Gianna ran well at the FLYRA Middle School State Track Meet in May of this year and set personal bests of 5:05 for the 1500m and 2:31 for 800m while earning two MS State Track medals as a 7th grader. Ayjah Silemon, a 7th grader at Hammocks Middle School, has the second fastest 3000m mark to date as she ran an 11:30. Ayjah actually appears in the top 3 marks in the 2.1 mile distance as well. 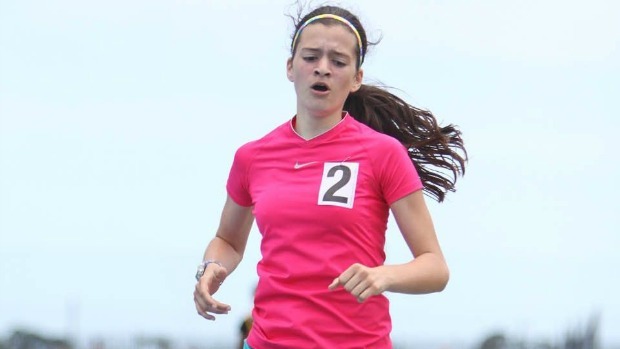 She runs out of Miami-Dade County and has owns track personal bests of 6:12 for 1600m and 2:33 for 800m. Isabella Pawloski, a 6th grader at Hermon Middle School, has the third fastest 3000m mark thus far having run 11:40. Isabella actually ran the FLYRA MS State XC Meet last year as a 5th grader and finished a very competitive 11th with a fast time on the Holloway course of 12:04. Isabella has track PRs of 5:50 for 1 mile and 12:30 for 3200m both set at Golden South Prep races in May of this year. Also posting top times for 3000m this MS XC season are the following: Charis Ivey, Ani Veltcheva, Josie Garba, Jasmine Hincapie, and Hailey Mira. Sebastian Roa, an 8th grader at Belen, currently tops the leader board for the 3000m distance with a time of 10:25. Sebastian set this mark at the Pine Crest Invitational and at 5:37 pace per mile it represents the most outstanding performance to date this year by a male middle school cross country runner. Sebastian has been running competitively since 2011 and has a bright future at Belen. Garrett Schilling, an 8th grader at Tavares Middle School, has the second fastest 3000m time at 10:31. Garrett has also been running competitively for several years and with his stellar 3rd place finish at last year's FLYRA MS XC State Meet, he is the top returning male runner and one of the favorites to win the FLYRA MS Championship this year. Notably, this weekend at The Fleet Feet Invitational's 3200m MS race, Garrett beat by 10 seconds or more a large contingent of Belen's best MS runners including Sebastian Roa and Rodrigo Madiedo. The Schilling vs. Belen wave will be one to watch at Holloway Park. 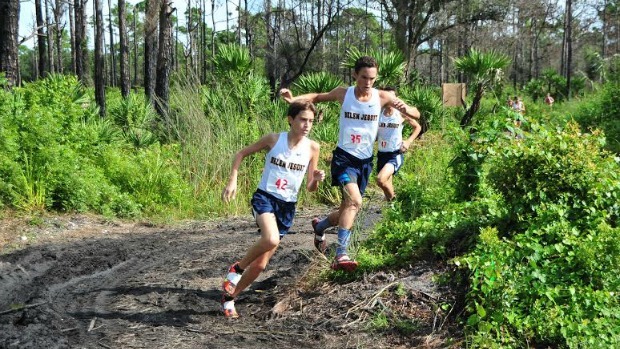 Gabriel Curtis, an 8th grader at Circle Christian, has the third fastest 3000m time to date at 10:34 when he won the MS race at the Florida Horse Park Invitational. Gabriel ran in the FLYRA MS State Track Meet this past May and has a personal best 1600m time of 5:21. Also posting top times in the 3000m distance are Rodrigo Madiedo, Henrique Souza, Burch Greene, Dylan Branch, and Aidan O'Gorman. Lawton Campbell, an 8th grader at Deerlake Middle School, currently sits atop the girl's MS state rankings for the combined 2 mile or 3200m course length having run a 12:40 time for 2 miles. Lawton ran in the FLYRA MS State Track Meet this past May. She has track personal bests of 5:42 for 1600m and and 2:39 for 800m. Alyson Churchill, a 7th grader at Swift Creek Middle School, has the second fastest 2mile mark for MS girls in the state thus far at 12:48 for 2 miles. Alyson has competed in three 2mile XC races this past September and set new PR's in each successive race. Hannah Lagmiri, an 8th grader at Oasis Charter Middle School, has the state's third fastest mark in the 2mile/3200m length at 12:50.10 for 3200m which converts to a 12:54 for 2miles. Hannah has been running competitively for several years and competed last year at the FLYRA MS XC State Meet. Also posting top times for the 2mile/3200m length course are the following: Alexa Gonzalez, Megan Churchill, Emily Molen, Emily Culley, and Chase Merrick. Johnny McClure, a 7th grader at Maclay School, is currently the state's top ranked male MS runner at the 2mile or 3200m distance having run 11:37 for 2miles. Johnny has been running competitively for 2 years and has track personal bests of 5:37 for 1600m and 11:22 for 3000m. He has cut his 2 mile time down over 90 seconds since running the distance last fall as a 6th grader. Mamush Galloway, a 7th grader at Trinity Prep, has the State's second best time for male MS runners at 11:41 for 3200m which converts to 11:45 for 2miles. Mamush ran in the FLYRA MS XC State Meet last year and remarkably finished in 7th place as a 6th grader. He and Garrett Schilling were the only non-8th graders to crack the top 10 at last year's MS state meet. Mamush has run 17:09 for 5000m and 5:08 for 1600m on the track. Maxwell Eastman, an 8th grader at Maclay School, has the State's third ranked time for male MS runners at 11:46 for 2 miles. This is Maxwell's third year running competitively. He ran in the FLYRA MS XC State Meet last year as a 7th grader. This season he has already knocked 30 seconds off his prior PR for the 2 mile distance. Other top times so far this year for MS boys in the 2mile/3200m distance have been delivered by Garrett Schilling, Brenden Faulkner, Kayamo Galloway, Jahaz Morgan, and Angel Castro. Rahyah Andressohn, a 7th grader at Richmond Heights Middle School, has the top time in the 2.1 Mile race so far this year. Rahyah ran a MS course record time of 12:32 at Larry and Penny Thompson Park. Rahyah's 12:32 mark for 2.1 miles at L & P represents 5:58 per mile pace for over 2 miles and is the most outstanding cross country performance by a MS girl in the state thus far this year. Rahyah has already competed three times at the FLYRA MS XC State Championships and twice at the FLYRA MS State Track Meet. She has personal bests on the track of 10:55 for 3000m and 5:06 for 1500m. Natalie Varela, a 7th grader at West Miami Middle School,has the second ranked 2.1 mile time at 12:42. Natalie has previously run in FLYRA's MS XC State Meet and the FLYRA MS State Track Meet. She and Rahyah have been pushing each other at Miami-Dade County meets on the cross country course and on the track since last year as 6th graders. Natalie has track personal bests of 5:03 for 1500m and 5:35 for 1600m. Ayjah Silemon, a 7th grader at Hammocks Middle School, has the third best 2.1 mile time at 13:09. Ayjah has clearly been training hard as she has cut 2:36 off her 2.1mile PB from 2013. Other top times at the 2.1 mile distance include Rebeca Bergnes, Melissa Martinez, Bianca Banato, Nicole Martinez, and Rebeca Rodriguez. Rodrigo Madiedo, an 8th grader at Belen, has the top ranked 2.1 mile time having run the distance in 11:57. Rodrigo has previously competed at FLYRA's MS XC State Meet and FLYRA's MS State Track Meet. Rodrigo and his Belen teammate, Sebastian Roa (both pictured above), are closely matched and have each beaten the other in races so far this cross country season. Rodrigo has track personal bests of 5:05 for 1600m and 2:18 for 800m. Sebastian Roa, an 8th grader at Belen, has the second best 2.1 mile mark at 11:59. Sebastian, along with his Belen teammate, Rodrigo Madiedo, will challenge for the top spots at Holloway Park on November 1. Luciano Bettochi, an 8th grader at Belen, has the third best time in the 2.1 mile event at 12:22. Luciano has previously competed at the FLYRA MS State Track Meet. He has a personal best of 11:59 for 2 miles run on a cross country course. Also posting top times in the 2.1 mile event are Henrique Souza, Adrian Bichara, Damauri Little, Yader Portocarrero, and Juan Miguez. The month of October is upon us and the MS cross country calendar is full of MS Meets including all 5 Super Qualifiers for the FLYRA MS XC State Meet. This year FLYRA will crown two new MS Cross Country State Champions and the competition for medals and the MS Team Championship promises to be fierce. Keep running fast and having fun and I'll be back at the end of October to review the top MS performances at Qualifiers and preview the MS State Cross Country Meet.